Israel withdrew from Gaza in 2005, but why should that be relevant? I looked at the minutes of the cabinet meeting. This was the only international topic mentioned. I looked at the minutes from every cabinet meeting this year. This was still the only statement on anything happening outside South Africa. 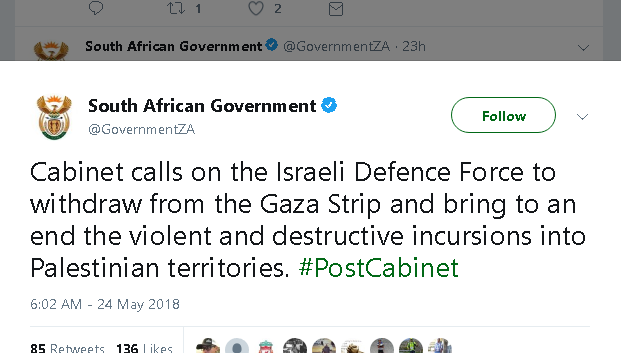 As hundreds are killed weekly around the world, the only people that the South African government seem to care about are the members of Hamas and other terror groups who are the vast majority of those killed in Gaza. Did BDS stop Shakira from playing in Israel?